Welcome to the Home Page of the Johnson’s Island Preservation Society for Ohio’s most significant Civil War site. 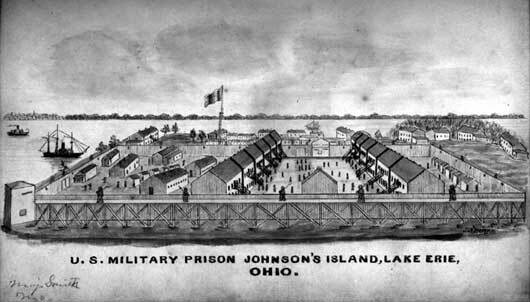 This web site provides listings of Confederate prisoners of war and Union guard garrison, the history of Johnson’s Island, and information on visiting the island and POW cemetery which overlooks Sandusky Bay in Lake Erie. The Civil War section also includes POW letters and autograph books. Sketch of Prisoner of War Stockade made by prisoner for autograph book of Confederate Captain C. W. Fraser. 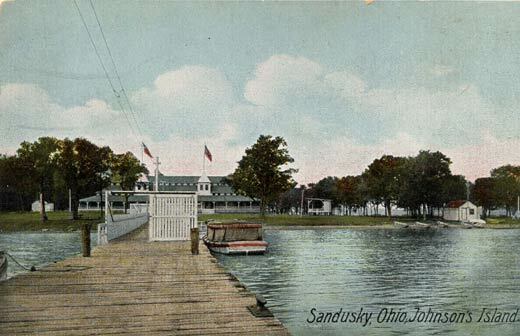 The creation and administration of the Depot of Prisoners Of War, Johnson’s Island, Sandusky Bay, Ohio, is perhaps the most historically interesting part of the island’s colorful history. During the 40 months of its existence, approximately 10,000 men were processed into the stockade on Johnson’s Island. Most were Confederate officers. Twenty-six were either generals or officers who became generals during or after their imprisonment. Others confined there were a small number of privates, bushwhackers, guerrillas, and citizens suspected of disloyalty to the Union. The maximum number of prisoners at any one time was about 3224 in January, 1864. For more information, explore the history section of this web site. A comprehensive history of the island must include the Pleasure Resorts and the Quarry operation. There were two resorts on the island at different times. In 1894, the Johnson’s Island Pleasure Resort Company leased twenty acres of land from Leonard B. Johnson. This resort closed in 1897 due to an unfortunate accident and a fire that destroyed the large pavilion. The second resort opened in 1904, using the same name. Despite large crowds and many improvements, this resort closed in 1906. An existing quarry on the island was enlarged in 1901 to produce limestone for breakwaters in Cleveland, Lorain, Cedar Point and other locations. During the quarry operation, a village for approximately 150 people was constructed. It included a school, tavern and post office. Quarrying on a large scale ended in 1908 but stone continued to be mined from time to time. For more information, explore the history section of this web site. Our goal is to preserve and protect the historical heritage of Johnson’s Island for future generations to enjoy and study. This is being accomplished by enhancing the education of the communities of Northwest Ohio; by disseminating information to all those interested; and by allowing visitors to view many artifacts, letters, diaries, autograph books, official records, and educational exhibits at our Museum in Marblehead and at the Veterans Home in Sandusky, Ohio. For more information, explore the visiting and membership sections of this web site.